For Halloween, Scout said she wanted to be Rapunzel, from Tangled, because she has long golden hair like Rapunzel. And we agreed, thinking it would be easy to throw a velvety purple dress (that we already had) on her and braid her hair. Then she started to talk about how her hair wasn't long enough. And it didn't light up. And telling us that we needed to figure out a way to make her hair do that. 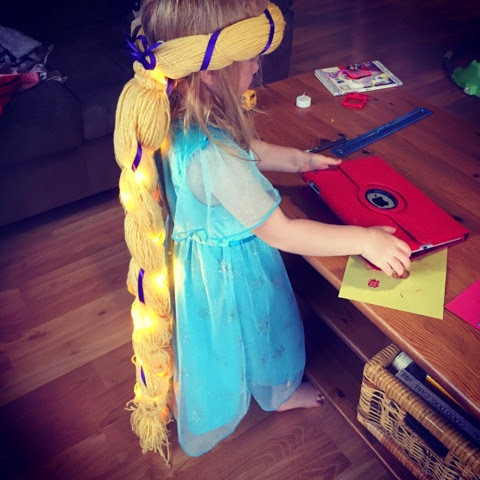 Sweet Aunt Rachelle found a blog explaining how to make a glowing Rapunzel wig. And her dad was sweet enough to implement the idea. Scout modeling it, while wearing her Elsa dress. She wore the fabulous wig, with the dress, to my sister's church Halloween party. As you can see on this lovely video clip, one of the few pictures that I took. She wore the wig for about 20 minutes. Then she took the wig off so she could eat dinner and play games easier. And on actual Halloween? For trick or treating at the mall? She wore an Princess Sophia dress and a safari hat. Kids.